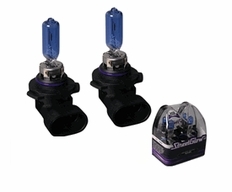 The StreetGlow 9005 Xenon-White Bulbs utilize a high pressure charge of Xenon gas, which has an excellent thermal efficiency. Standard halogen bulbs use a lower charge of Bromine gas, which is not as efficient. StreetGlow's use of Xenon gas increases the bulbs luminous flux by more than 20%, giving light which has a brilliant white quality, and far brighter than light produced by halogen bulbs of the same wattage. Price is for a pair of Streetglow 9005 Bulbs.